With a stay at Sundowner Spanish Lady Motel in Napier, you'll be within a 10-minute drive of Napier Beach and National Aquarium of New Zealand. Featured amenities include luggage storage and laundry facilities. Free self parking is available onsite. When you stay at Birchgrove Cottages in Whangarei, you'll be next to a golf course and 9 minutes by car from Whangarei Falls. Free self parking is available onsite. 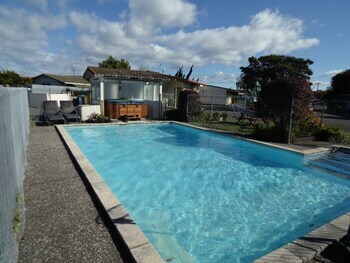 Located in Kaeo, Cavalli Beach House Retreat is by the ocean and within the vicinity of Rainbow Warrior Memorial and Matauri Bay Beach. Free self parking is available onsite.